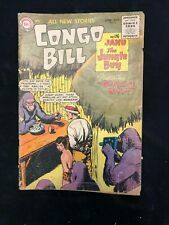 I have for sale a Congo Bill #4. cover date is Feb-March, 1955. It is a nice mid-grade copy of a tough book. This has great cover gloss, no creases. The bottom staple is not attached. Congo Bill. Issue: 1 /Year: 1954Condition: VG. First issue, scarce early 1950's DC title. Grade: GD- 1.8. Published 1954 by DC. "The Golden Gorilla!". "Chota the Chimp!". Also includes: "The Queen of the Jungle!". and "Fear in the Jungle.". Cover by Nick Cardy. This is a low grade item. "Hunter of Jungle Sounds!". A museum curator seeks out hyena laughs, snake hisses, rhino snoring, and other animal noises while Congo Bill battles a jungle hood. "Safari in the Sky!". This Noah's Ark-type tale finds Congo Bill using balloons to achieve his objective. 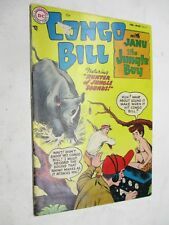 Crocodile issue, shark feature, scarce jungle story comic book. Congo Bill. Issue: 2 /Year: 1954Condition: FR/G. This includes CGC, PGX and CBCS graded comic books. No exceptions. 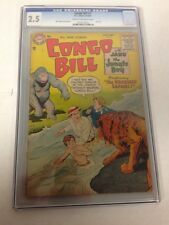 Congo Bill #7 CGC GRADED 2.5 - listed as "SCARCE"
CONGO BILL #7. CGC GRADED . INCLUDED ARE HIGH GRADE, SCARCE AND KEY ISSUES. HIGH GRADE, KEY. ( NON-THIRD PARTY GRADED ). BOOKS ARE LISTED ALPHABETICALLY AND BY PUBLISHER. THIS IS INTENTIONAL BLACK 12. After experiencing a panther and a baboon in the wild, candy heiress Alva Matson decides that adventuring with Congo Bill is not her cup of tea. Also includes: "The Man Who Hunted Congo Bill!". and "The Gentle Jungle Killers.". 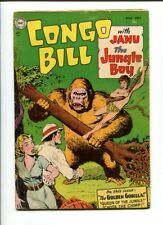 Baboon cover, scarce 1950's jungle comic. Congo Bill. Publisher: DC. Congo Bill #3 CGC 6.0 F Off white to white pages 12/54-1/55 Nick Cardy cover & art. If it looks like there might be scratches on the case, there aren’t - it is only from our scanner. The case is perfectly fine. This is another of those VERY SCARCE DC comics from the mid-fifties! It has nice bright cover color. Over all, it is a very nice book and would be great to add to your collection! The comic(s) pictured are the exact comics you will receive. Congo Bill #4 CGC GRADED 5.5 - listed as "SCARCE"
CONGO BILL #4. CGC GRADED . INCLUDED ARE HIGH GRADE, SCARCE AND KEY ISSUES. HIGH GRADE, KEY. ( NON-THIRD PARTY GRADED ). BOOKS ARE LISTED ALPHABETICALLY AND BY PUBLISHER. THIS IS INTENTIONAL BLACK 12. Congo Bill #3 CGC GRADED 5.0 - listed as "SCARCE"
CONGO BILL #3. CGC GRADED . INCLUDED ARE HIGH GRADE, SCARCE AND KEY ISSUES. HIGH GRADE, KEY. ( NON-THIRD PARTY GRADED ). BOOKS ARE LISTED ALPHABETICALLY AND BY PUBLISHER. THIS IS INTENTIONAL BLACK 12. Here is the second issue of this very scarce DC title. It's in VG/VG condition. Overall, though, a nice collectible issue. Grade: CGC 3.0. Published 1954 by DC. "The Golden Gorilla!". "Chota the Chimp!". Also includes: "The Queen of the Jungle!". and "Fear in the Jungle.". Cover by Nick Cardy. of comics, generally about 25-40 comics depending on page count. "River of 1,000 Crocodiles!". "The Great Jungle Race!". Congo Bill's zebra races Janu's Hyena. Also includes: "Elephant's Graveyard!". and "The Trophy Hunters.". Cover by Nick Cardy. Grade: CGC 6.0. 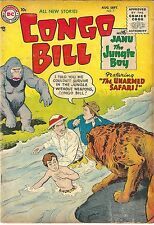 DC Comics CONGO BILL #1 Aug.-Sept 1954 in VG Very Scarce! Here is a copy of the first issue of this very hard to find DC comic from the mid-1950s. All of these issues of this title are considered scarce! Copies might surface for a while, but then get snatched up into collections. Published 1954 by DC. Back cover and last page missing (does not affect art or story). Complete spine split through all pages. "The Golden Gorilla!". "Chota the Chimp!". Also includes: "The Queen of the Jungle!". Published 1954 by DC. "The Golden Gorilla!". "Chota the Chimp!". Also includes: "The Queen of the Jungle!". and "Fear in the Jungle.". Cover by Nick Cardy. This is a low grade item. It will be complete and readable, but will show significant wear. This is another one of those very, very scarce mid-fifties titles! This copy is in VG to Fine- condition. This the second issue with the Comics Code on the cover. Bombo the Rogue Elephant issue! Scarce 1950's comic - 1st code issue. Congo Bill. Issue: 5 /Year: 1955Condition: VG. Baboon cover, scarce 1950's jungle comic. Congo Bill. Issue: 3 /Year: 1954Condition: VG. Congo Bill #2 CGC 5.5 F- Off white to white pages 10-11/1954 Nick Cardy cover & art. If it looks like there might be scratches on the case, there aren’t - it is only from our scanner. The case is perfectly fine. Congo Bill #1 CGC 5.0 VGF Cream to off white pages 8-9/1954 Nick Cardy cover & art. If it looks like there might be scratches on the case, there aren’t - it is only from our scanner. The case is perfectly fine. Congo Bill #7 CGC 5.0 VGF Off- white to white pages 8-9/1955 Nick Cardy cover & art. 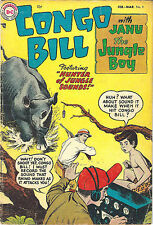 Final issue of the elusive jungle comic book series. Congo Bill. Issue: 7 /Year: 1955Condition: VG. Congo Bill #6. 3.5/VG- Condition. #3 (12/1954-1/1955; Nick CARDY Cover & Art; PRE-CODE;. CONGO BILL #3. CONGO BILL (DC Comics Pub). Pre-Code 1954-1955 NICK CARDY-c/a SCARCE. CONDITION =CGC; G/VG, 3.0 with Off-WHITE pages. (10) Reasonable Market Value Pricing;. ).